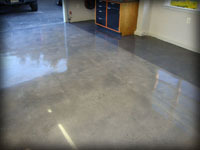 Polished concrete is the process of grinding, densifing, and polishing concrete to a hard reflective surface. No epoxies, urethanes, or coatings are used. Floors can be natural (no color) or dyed. 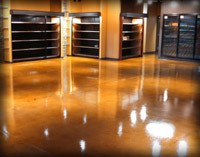 Polished concrete is easy to maintain and can last up to 100 years. Clear Epoxy Floor is a clear coat of epoxy topped usually with a protective coat of Polyaspartic(anit-skid optional) applied to natural(no color) or dyed/stained concrete floor. This produces a 100% sealed floor that is easy to maintain and has a long lasting finish. 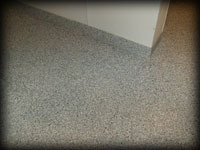 This seamless floor is constructed using 100% solid epoxy or MMA and is made with color flakes or granular quartz. This floor extremely durable and very consistent. This floor system will cover all repair work in the floor and is excellent protection from virtually any spills. The floor is 100% sealed. 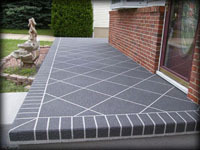 GraniTite© is a quartz coating system applied to outdoor concrete. GraniTite© is colorfast, UV fade-resistant, flexible and provides the highest slip resistant rating possible. Many Colors to choose from.